As of July 1st, 2018, the FSMTB made the following changes to the MBLEx: Overview of Massage/Bodywork Modalities, History, and Culture, (CAM) will no longer be a separate section. Histories and Culture subcategories will no longer be tested. Overview of Massage/Bodywork Modalities will be absorbed into the Benefits and Physiological Effects of Techniques that Manipulate Soft Tissue (Application). The MBLEx (Massage & Bodywork Licensing Examination) is governed by the Federation of State Massage Therapy Boards FSMTB. It is designed to provide a standard examination for students of Massage for entry-level professional scope of practice in gaining licensure. The FSMTB was established in 2005 with the intent to build a support system for the Member Boards. Their goals from the beginning were to work towards cooperation in implementing regulations and procedures for the requirements to establish safe and effective Massage Therapy and Bodywork practices. The MBLEx is not set up to trick or deceive the test taker. There is only one correct answer to a test question. The candidate will have 2 hours to complete the exam, including 100 multiple-choice questions, along with a Security and Confidentiality agreement and a Survey. If the test taker takes a break, the time does NOT stop. The candidate must answer the question when it is presented to them. They are NOT able to flag the question and come back to it later. The candidate will not receive a numerical score upon completion of the exam. The candidate will be given a pass or fail score. If the candidate receives a fail score, the candidate will be given diagnostic information that reports good, poor, or borderline performance in each of the exam content areas. The diagnostic information for each category will be given to the candidate at the testing center when the exam is completed. Score results are based on the difficulty and number of questions the candidate answers correctly. The exam has seven concentrated areas of content: Client assessment, reassessment, and treatment plans, Benefits and Physiological effects of Techniques, Pathology with Contraindications, areas of Caution, and Special Populations, Ethics- Boundaries-Laws & Regulations, Guidelines for Professional Practice, Kinesiology, and Anatomy & Physiology. The Content Outline for the MBLEx breaks down further the categories used for establishing the questions in the MBLEx. $195.00. If you fail the exam you will have to apply and pay the fees again. The breakdown above allows you to see where the MBLEx focuses their content, creating a focus for your studies. The highest concentration is in the Professional Ethics and Guidelines sections, followed closely by A&P/Kinesio/Body as well as the Assessment and Application (as it should be). The Pathology questions are good to know because they help with the knowledge of your client's conditions so that you are able to make connections on how massage effects the professional community as a whole today. When you are studying with us, it is important to note the content weight in order to better prepare yourself for the exam. -The MBLEx is a CAT or Computer Adaptive Test. This means that each question must be answered before the next question can be displayed. When a question is answered correctly, the next question is a slightly higher level of difficulty. The levels of difficulty will increase upon each correct answer. If you answer incorrectly, a slightly easier question is given. This way of testing customizes the exam to the candidate's ability level. The weight of each question is determined by the level of difficulty, you must answer enough difficult questions to obtain a passing score. If a candidate does not pass the MBLEx, he/she will need to reapply with a new online application and pay the fee again. A 30 day period is required from the date of the failed attempt to obtain an ATT or Authorization to test for another attempt at the MBLEx. To use our site effectively it is best to review the content of your graded exams. When you have finished your practice test and have received your score, don’t stop there. Check each incorrectly answered question and find out why you missed it. Was it because you didn't read the question correctly or missed one qualifying word? If you answered the question correctly, it is important to read the rationale, there may be further insights that can help you in the long run with a deeper understanding about the subject, or an easier way to remember the content. When reviewing your tests, make sure you are breaking down the questions effectively. This is the time to practice reading each word slowly. It also helps, while reading the question, to insert one of the answers into the question to see if it fits or to see if it registers with anything in your knowledge base. If you take your time on each word, focusing on the overall relevancy, you will train your brain to pick out the best possible answer. Visualize the muscle in relation to the body, see the direction of the fibers, recall the origin and the insertion (more moveable attachment) and run through the available actions of that muscle. Practice using scrap paper to write things down. Sometimes writing them down will trigger the information you are looking for. When you take the exam at Pearson VUE they will give you paper and pencil or white board and marker to use while you take the exam and then they will ask for it back when the exam is complete. If you need more paper during the exam, you may ask for more after turning in the paper you fill up. It is also best in your preparations to study at least an hour each day. When you answer a question incorrectly, use that information to find a subject matter you need to learn more about. Read all about it in your books, and look it up online. Try to make deeper connections in regards to the body relationship as a whole. As you continue to do so you will find that you can recall information faster and with more accuracy. To be qualified to take the MBLEx you must apply directly with the FSMTB. The fee required to take the exam is $195 due with the submittal of your MBLEx application. If you apply through your state licensing board or agency you do not need to fill out and send the application to FSMTB, the board or agency will complete that process for you. Filling out and sending in the application does not guarantee that you are accepted to take the MBLEx. You must wait for an ATT (Authorization to Test) that will be sent directly from the FSMTB to your email. If your state board or agency has sent in your eligibility information you will get a payment voucher that you must return in order to receive the ATT. Once you have completed this process you can then set up an appointment to take the exam with Pearson VUE. You must take the exam within 90 days of receiving the ATT, or you will be required to go through the application process again, including fees. The Massage-Exam.com website is a resource for basic Massage information about our online practice exams and other links to major Massage organizations. We are not affiliated with NCBTMB, FSMTB, AMTA, ABMP, ect. Information gathered from these organizations websites is to help educate and inform our fellow Massage Therapists. These tips have been gathered from dozens of resources. They can be applied to the MBLEx as well as any test structured in the same format. Taking the MBLEx can be a painless experience if you are prepared with the knowledge of the course material AND an understanding of what to expect of the MBLEx test itself. We have created this page to aid in answering some of the more common questions associated with taking the MBLEx. This includes facts and advice related to taking and passing the exams. It is intended to aid the MT candidate in his or her pursuit of license and registration as a Massage Therapist. MBLEx is a CAT or Computer Adaptive Test. This means that each question must be answered before the next question. When a question is answered correctly, the next question is a slightly higher level of difficulty. The levels of difficulty will increase upon each correct answer. If you answer incorrectly a slightly easier question is given. This way of testing customizes the exam to the candidate's ability level. The weight of each question is determined by the level of difficulty, you must answer enough difficult questions to obtain a passing score. • MBLEx test questions are multiple-choice with 4 potential answers. All questions are created by a team of 15 psychometricians and testing experts along with a core group of 60 subject matter experts. That created a list of all the tasks that a massage or bodywork therapist needs to be able to perform on the job. This list of tasks was then validated by several thousand practitioners (7,646). These testing experts made sure that there is only one "best" or "correct" answer, and that "each incorrect answer has some level of plausibility.” Additionally, each question and answer must be easily found in the MBLEx bibliography of books used in teaching Massage Therapy curriculum. • The MBLEx is a CAT or Computer Adaptive Test. • The MBLEx is administered at the Pearson VUE testing center. This CAT or Computer Adaptive Test will deliver questions one at a time to the candidate. Your name will be displayed at the top of the screen and on the top right side will be displayed your time remaining (you also have the option of clicking on the clock icon to get rid of the time count). The progress indicator under the time will show you the question number you are on and then the total number of questions. • The MBLEx CAT or (Computer Adaptive Testing) is tailored specifically to the individual MT or bodyworker candidate. This testing method is considered state of the art and should make the MBLEx exams more precise, fair, and accurate. What does that mean? Basically each item (question) is given a weighted point value. This value is based on the difficulty of the question. A harder question has a higher point value. An easier question has a lower value. • MBLEx will deliver questions one at a time to the candidate and will NOT be randomly chosen. The questions are rated along the same ability scale as the candidate is exhibiting proficiency. The first questions on the exam are generally just below the passing standard. If a question is asked that is below the candidate's level of ability, the probability is high for the candidate to answer the question correctly. If a question asked is above a candidate's level of ability, he/she has a high probability of missing it. If the candidate answers the question correctly, a slightly more difficult question will be delivered next. • When answering the question you may click on the bubble to the left of the correct answer or on the answer itself. If you click again, this will remove the selected answer. • Flagging exam questions for later review is not permitted on the MBLEx. • There may be some questions that have a graphic displayed in order to fully answer the question correctly. • Exam fees ($195) can be paid online to the MBLEx website. You must first be registered and sign into your account. You can pay by credit card or with a payment voucher if your school provides one. You may also mail in payment. Mailing in payment will delay your ability to schedule your exam until the payment has cleared. • If you do not pass the exam you may retake it after 30 days. This period is to provide you with time to study. The MBLEx Retake Application form and payment ($195) must be paid again. • You will receive the official pass or fail report at the Pearson VUE testing center immediately after your examination. No other report will be sent to you in the mail or email. • The score will automatically be reported electronically to the state board that you entered during the application within 24 hours. The score will be reported to this first state at no cost. • If you need to have your pass or fail report sent to another state board, or need another hard copy to be sent to either you or another business, you must fill out the MBLEx Mobility Form and pay $20.00 per report. The following advice has been gleaned from dozens of sources. Information contained within has been compiled from interviews with Massage Therapists who have taken and passed the exam, related Massage discussion forums, and nationally recognized test-taking authorities. • Realistically you should have a working knowledge of all materials covered in your massage curriculum. There is no secret method to passing the Exam. The Massage-Exam Practice Testing Application will help you become familiar with the format and content of the multiple choice questions. You can solidify the concepts of massage assessment and application by studying the massage answer rationales that accompany every question. • Even though the MBLEx has a minimum passing threshold, you should strive to learn more than just what is necessary to pass the exam. Reading the rationales that accompany every question on Massage-Exam will help further your knowledge and open your understanding to the concepts taught from your text. This will help build confidence in your personal abilities as a Massage Therapist and add a strong foundation to your new career. • Be sure to eat a balanced diet and drink lots of water in the days before the massage exam. Try to include B vitamin foods in your meals like oatmeal, bananas, and raisins. Get plenty of rest. • Do not try to cram for the massage exam. This is not an effective way of preparing for any exam. If you don't know the information you need the night before the exam, you are not going to know it after a day or night of cramming. Get some sleep or just relax the day or night before the exam instead of cramming. The rest will do more for you than frantically pouring over your textbooks and practice massage exam questions. • Do not eat a sugar-loaded meal or drink a lot of coffee before your exam. This will only add to existing test anxiety. • Study for your massage exam regularly over several weeks to get the best results from your test preparation. • Download a map of the testing center location and make sure you know exactly where the test center is. Arrive early to eliminate the stress of being late. Being late for the MBLEx is not tolerated and you will have to reschedule. You must be approved and signed up for the MBLEx, you can't just walk in to the testing center and request to take the exam. You can only bring your photo ID and a couple of pencils. Scrap paper will be provided for you in the testing area along with pencils if you are in need. These items must be returned at the end of the exam. Some testing facilities may even have a locker issued to you for your personal belongings to be stored during the exam. • Dress in multiple layers when you go to take your exam so that you can take off what is not necessary if you are too warm. The temperature of the testing center can change during the day especially if the exam is held in a seldom used room or building. • Use the restroom before you start the exam. You are allowed to go during the exam, but take care of it sooner rather than later. You will be required to take one form of ID with you while the other stays within the testing center. It will be verified each time you leave and enter. Note: Your time on your exam continues to run when you take a break or go to the bathroom. • You must bring two forms of ID to the exam site. One of the IDs needs to have a photo. • You CANNOT skip a question and come back to it later. The nature of the CAT exam requires that you answer each question individually before any additional questions are delivered. The next question you get delivered is based on how you answered the previous questions. This is why you must make a choice before you can proceed. • Use caution with questions that contain words like always, except, never, most appropriate, and other words that qualify a question. Watch out for words that put limitations on a potential answer. • Be sure to read the entire massage question completely at least two times and then formulate the correct answer in your head before you take a look at the multiple choice answers. If you look at the choices of answers before you understand the question entirely, you may be led into choosing an incorrect answer. • There are four possible answers to each massage question. Two of the answers can often be eliminated right away after reading the question through two times. Once these two answers are eliminated, you only need to decide which answer is the "best possible answer" between the two remaining choices. • Don't over think or complicate the question. Do not add elements into questions that are not already written into it. These things can cause you to overlook the basics of the question, which is usually what you are being tested on. • The MBLEx results page provided at the Pearson VUE testing center will ONLY convey if the exam has been passed or failed. If the exam result is fail, the report will show each content area with a good, poor, or borderline result next to the content area and nothing more (no numerical score). You are given one hour and 50 minutes to complete the exam of one hundred questions with 5 Minutes for a survey and 5 minutes for the Security and Confidentiality agreement added on. The percentage weight of each question is based on its difficulty. The Modified Angoff Procedure and Criterion-Referenced Scoring is used to determine the passing score. By using these methods, the MBLEx is used to evaluate the effectiveness of teaching programs and to determine the students' mastery of concepts and skills. • If you are unsure of the correct answer, it is better to make an informed guess. • Look at the breakdown of questions. A large portion of the exam is related to Professional Ethics /Standards (31% or approximately 31 questions), and A&P/Kinesio/Body (23% or 23 questions). The assessment (17% or approximately 17 questions) and application (15% or approximately 15 questions). Many students overlook this. • Remember, although the MBLEx exam looks at a minimum requirement to pass, nobody wants a "just made it by the skin of the teeth" therapist. Know your stuff. • Obviously take advantage of the Massage Practice Tests here on our site. There is detailed score tracking and exam review features that let you see your strong and weak areas while you continue to take exams and improve. Most exams given in the United States follow the formula below in developing questions. The MBLEx is one of those tests. If you understand what type of questions you are being asked, you will know how to apply the correct response from your knowledge base. Knowing this information about how questions are constructed can help relax the test taker in the process of recall and will boost the test taker’s confidence. Read through the following information then start to apply this knowledge during practice tests. It will help increase understanding and test taking acumen and decrease stress associated with taking exams. Breakdown every question to understand its subject matter by first reviewing your Knowledge. What do you remember or recognize from your studies and memorization? Have you created charts, labeled diagrams, or taught another person what you have learned? Did you ask questions as to Who, What, When, Where, Why, and How this information applies to being a Massage Therapist? Next, it is best to evaluate your Comprehension. What is your interpretation of the subject matter? What other circumstances, muscles, or pathologies also benefit from this knowledge? Is your knowledge organized and can you describe, explain, or discuss Who, What, When, Where, Why, and How in your own words? After you have a working knowledge and comprehension, it is time to Apply. Can you comfortably demonstrate a good base of knowledge and comprehension by observation, interpretation, and practice? Can you safely and confidently use the facts, principles, and rules? Why is this information important? What other examples can be derived by these findings? Can this pathology relate to other areas of concern? Once you make new connections within your knowledge base and apply or put those connections into practice, you are ready to Analyze. How do your findings compare or contrast to previously gained knowledge? Do you note consistent evidence that can be outlined? Can you then break it down into parts and compartmentalize to classify or identify? In separating the whole of the results, can you differentiate and distinguish its parts? Are the test results consistent with ROM and PA analysis? Can you identify the main muscles involved in the onset of the pathology? 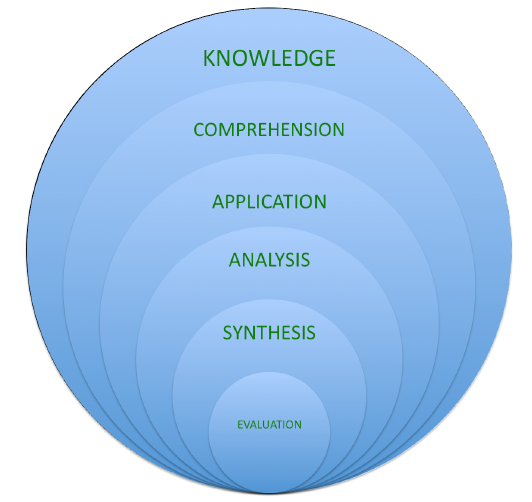 Now that you can effectively Analyze, Apply, and Comprehend your Knowledge, you are ready to Synthesize. How can you customize a homework plan for better function? What modality or treatment technique can you add to the next massage to create an improvement? When would you like your client to come in again and how often? Do you keep up to date chart notes in order to prepare and plan for future massage treatments? Can you confidently suggest a referral to other healthcare practitioners when needed? To complete these steps of knowledge, you must now Evaluate. Do you have enough knowledge for a comprehensive application in the making of treatment decisions? Can you prioritize the application of treatment for the most benefit to the client? How would you decide what to do next? Are you gathering enough information from the client? Are you asking the right questions to get the most descriptive answers? Can you issue a safe prediction of your treatment work? What can you improve for future treatments? Why is self-evaluation important? This is the nuts and bolts of how an MBLEx question is built. Below is an example of how a question is constructed. This will give you some insight into the thinking behind each question. A well-designed multiple-choice item consists of three main components: A stem (asks a question or poses a statement which requires completion), key (the correct answer/s), and distracter(s) (incorrect option/s). The following section is designed to enhance the candidate’s understanding of the question writing process. What are the first questions that need to be asked? The Massage Therapist must be mindful of the client and the client’s pain tolerance. Ask more history questions to have a better understanding of the injury stage. 1. ROM helps to find out the muscles involved in the primary area and the compensating or pain posture offenders (Key). 2. Ask questions to see if the spasms are protecting the injury to determine if the client needs to see a doctor or if you are able to relieve the spasms. 3. Obtain information about what the client is wanting to achieve from this massage and give realistic information about your abilities, what you can and cannot do and why. 4. Create a treatment plan for the massage and give useful homework to obtain more relief. In this example you can see that the question is asked at the Evaluation level of Bloom’s Taxonomy. That is the highest form of question. It requires you to know information about each answer option and then weigh each answer against the other to determine techniques and application. In this sample question you can see that a client can still obtain a massage if acute injury protocol is followed. The right information must first be obtained within the assessment in order to apply helpful techniques. The MBLEx likes to make sure the client’s safety comes first. It requires you to really think about each option and only use the information presented in the question and answers. Massage-Exam.com would encourage every person to read all the available information on the MBLEx website. They explain in detail how the tests are constructed and administered. Knowing this information helps you better prepare and be more confident in your ability to test. • Why did you choose this answer? • Was your 1st choice correct? • Did an answer choice you weren't familiar with distract you? • What factors in your thought process made you consider this choice? • What information must you retain in order to answer correctly next time? • Break down the original question first, focusing on the main content. • Write down, Verbalize, draw out, or review in your head what you KNOW about this content before looking at the answer choices. • Review the question again for determining factors that qualify an answer such as always, never, the age, and pathology or condition/ medication. • Then after a thorough breakdown and review of content you can determine the correct answer choice by eliminating the incorrect, or make an educated guess from the choices provided. • Take it one step further and review what you KNOW about the content in each answer choice. • You will find the cleverly close (distracter) answer choices trip you up less with making connections on content. • These strategies can be used on the actual exam at the Person Vue (except verbalization). • Describe terms, subject, or content in your own words. • Create scenarios where you may need to utilize this knowledge. • Teach a friend or fellow student what you have learned and encourage them to ask questions to strengthen your knowledge base. • Take specific notes, draw boxes or circles around content, or create an information tree. For better recall, visualize what you have created by putting it on paper. • Quiz a partner on focused content and come up with helpful strategies to remember the information. • Research unfamiliar terms and create a sound understanding of Root/ Prefix/ and Suffix's to have the ability to break down terms or words you may not be familiar with. • Don't forget to breathe!